I'd purposely not weighed myself in over a year because I'm disappointed with myself for letting my exercise come to a stand still. I still get out walking with the boys and play a lot of Hockey with them but I used to go out walking and sometimes running and it was part of the reason I lost over 3st a couple of years back. It's so easy to let things slide and although I've said in the past 'I don't have time' and 'I just want to relax of an evening with Mrs M', I am the only one to blame for the weight that I have put back on. 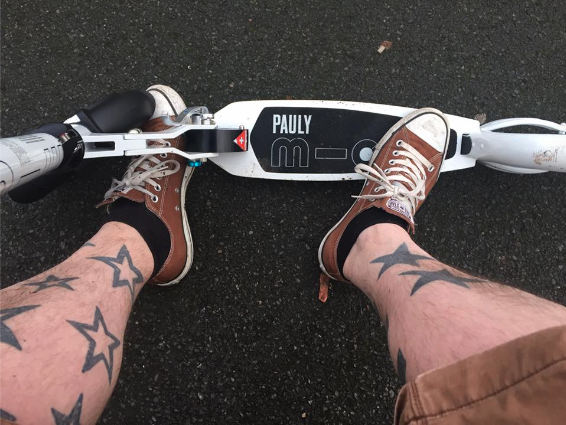 When I received a surprise package just before Christmas and was also told that one of the main aims for micro scooters during 2017 was fitness, I knew it was time to make a change. It's no shock to anyone that I love scooting, if you are local to us you probably see me and the boys whizzing about the streets and we can regularly be seen adventuring around the streets of London, museum hopping. I've never really pushed myself on the scooter to use it for proper workouts, but 4 weeks ago that changed. It all started one evening when Mrs M had work to do in the evening and I had nothing to do. It was dry outside and I'd picked up some lights so I thought 'what the heck I'll go for a scoot'. There is something so therapeutic about scooting, just me, the wheels and some great music to keep me motivated. I scooted 6 miles that night and although I tackled some pretty steep hills and had been out of breath a few times, the last leg back home had 10 minutes of flat, making it the perfect wind down, which meant that I was completely relaxed by the time I reached my front door. It's safe to say that I was hooked from that moment and my evening scoots have become a regular thing. After arriving back home after the 6 miles I realised that I could have actually scooted a lot longer. So when I went out again I changed my route and added a little longer to the journey, coming in at just under 9 miles. This was then extended to a 10.7 miles route and then to 13 miles. So this is what I've stuck with as it's the perfect route with a great variety of up hill, down hill and flat. Sometimes my route is a little shortened depending on how brave I am feeling as there is 0.5 miles of unlit road in a quiet area and sometimes I just don't feel like chancing it. Other times though I find myself with a little more time in the evening if I have started out early, so I scoot for longer. My top distance so far has been 15.3 miles and what is really interesting is that even after that I probably could have carried on, because scooting doesn't put the same strain on your legs as running. This solo scooting fitness adventure started on the 5th of January. I weighed myself that morning and I was pretty disappointed by the fact that I had put on 2.2st over the last year or so. It was all the motivation I needed to make this change. I weighed myself last week and was shocked to see that my evening scoots have taken 9lbs off of my weight which is a pretty amazing start I think. I cant wait to weigh myself in a few weeks to see if there is much change again. The great thing about this exercise is that I love scooting, so it's not a burden and I'm not having to force myself out of the house of an evening. Scooting with the boys on our home-schooling adventures has been a huge thing for us over the last few years and now these solo evenings are something to look forward to with a weight loss goal that is getting closer with each evening scoot.